In 8 Feb 2007 an odd radius display was produced by local heating plant plumes in -28°C temperature in Vaala, northern Finland. I photographed this display on a road about 1.5 km away from the heating plant. Odd radius halos in display were 18° halo, 23° upper plate arc, very faint 35° halo and rare pyramidal heliac arc. See arrows in a stacked and strongly unsharp masked photo shown. Pyramidal heliac arc is formed by reflection from pyramidal side faces of horizontally oriented pyramidal ice crystal. It is usually visible near the sun only. It is usually very faint but this time I was able to see it also visually. Same odd radius halos except 35° halo were also present in similar but much fainter display in Vaala couple of days earlier in 6 Feb 2007. 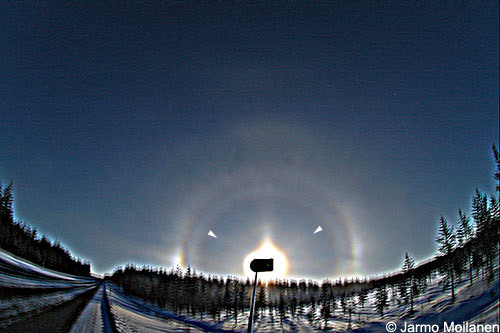 More photos from both displays can be seen in Jarmo Moilanen's halo photo gallery or directly 8 Feb. 2007 here and 6. Feb 2007 here.